La première fois que Sylvie Bourdon entendit parler du Domaine des Érables fut par le biais de son beau-frère. Curieuse de découvrir ce camping VR et chalets, non loin de leur résidence à Sorel, Sylvie s’y rendit, accompagnée de son conjoint Jacques Préville et de leurs trois enfants. Les quelques jours qu’ils y passèrent se transformèrent en une histoire d’amour qui dure depuis plus de 17 ans. Situé à seulement 20 minutes de Sorel et à 45 minutes de Montréal, Domaine des Érables, un camping VR et chalets Parkbridge, est une destination offrant une formule toute-incluse d’activités pour les familles souhaitant séjourner le temps d’une courte escapade ou l’été au complet. Une panoplie d’installations et d’activités pour les grands et les petits sont offertes, dont des terrains de hockey, de soccer, et de volleyball. Un parc aquatique très prisé comprend deux piscines, des jeux d’eau, un lac pour la baignade et un lac pour la pêche. Un spa pour se relaxer est aussi à disposition. Pourtant, d’après Josiane Gazaille, gestionnaire de propriété au Domaine des Érables, deux activités surpassent toutes ces options dans le coeur des plus jeunes. « Notre Noël du campeur et notre fête d’Halloween sont sûrement les plus anticipés », explique Josiane. Maintenant une famille de quatre enfants (la petite dernière, Magalie, est née pendant leur saison de camping en 2004), Sylvie et Jacques sont au Domaine d’avril à octobre chaque année. Ils font partie intégrante du camping puisque Sylvie y travaille comme préposée à l’accueil en chef et Jacques est responsable de l’entretien. Leurs deux fils, Alexandre et Jonathan, travaillent aussi sur les lieux. L’environnement familial est en grande partie la raison pour laquelle ils reviennent tous les ans. « Il faut faire attention où on met les pieds, il y a tellement d’enfants qui courent partout ! » ajoute Sylvie en souriant. Selon Sylvie, la sécurité au sein du Domaine permet de laisser librement les enfants jouer. « Dès que nous arrivons, mes garçons disparaissent toute la journée. Il y a tellement d’activités entre la patinoire, le parc, la piscine et les voisins qu’ils ne reviennent que lorsqu’ils ont faim. Mais ça ne m’inquiète pas du tout. On se connait tous ici », dit-elle. La plupart des voyageurs et saisonniers viennent de la Rive-Sud de Montréal ou de la région de Sorel, comme Sylvie. By STEPHEN A. WHITE The Central Alberta landscape is dominated by rolling hills interspersed with pockets of forest. Within these rolling lands just to the southeast of Red Deer lies a valley filled by a narrow natural lake called Pine Lake. This lake is supported by an aquifer fed by a watershed 120 square kilometers in size. Though intermittent streams and creeks flow into Pine Lake during spring runoff and rainstorms, it is the aquifer that keeps the lake stable. In the last 40 years, the average lake fluctuation between spring to fall has only been 40centimetres. 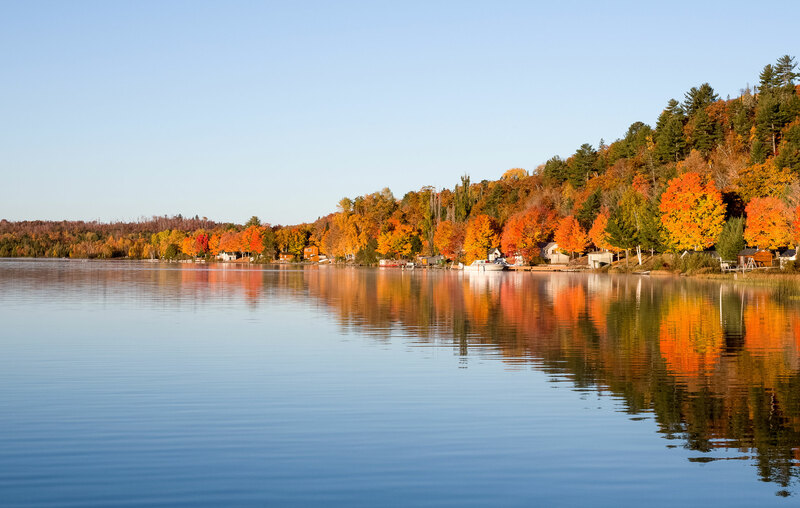 At the very north end of this beautiful lake, you will find Pine Lake Leisure – A Parkbridge RV Resort, featuring a sandy south-facing beach with a 100-slip marina. And while the beach captures the sun all day the RV resort is located within a mature spruce and poplar forest with 77 acres of natural terrain to explore. 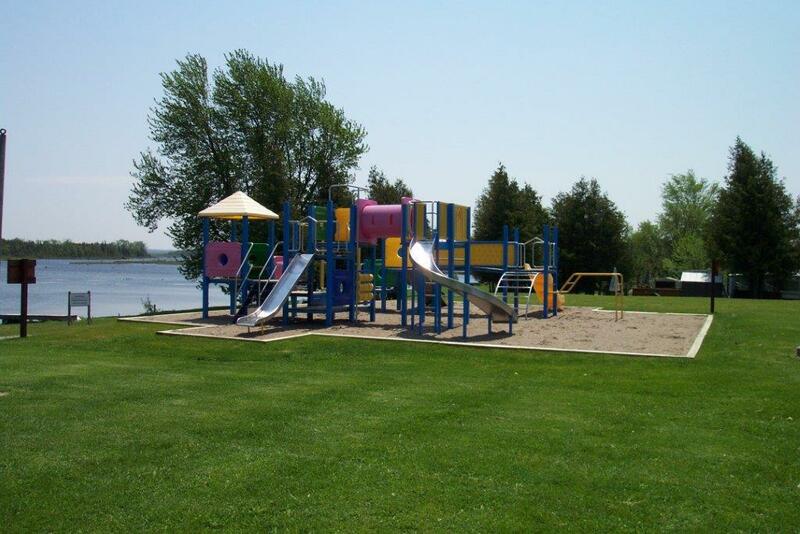 Pine Lake Leisure boasts a recreation hall, a large heated salt water pool, a snack bar, three playgrounds, a volleyball court, horseshoe pits, an arcade, a laundromat, shower facilities and a licensed convenience store. You can find relaxation on the beach or in the forest, or you can enjoy so many activities at Pine Lake. Planned activities are run for the kids at the activity centre. If you like water sports, Pine Lake is for you with skiing, wake-boarding and tubing and, for the real brave, riding an air chair. An air chair looks like a wakeboard with a chair on top for the rider to sit on facing forward. The board is connected to an aluminum bar that extends out from the bottom of board and connects to a hydrofoil. A hydrofoil is an underwater wing designed to lift the hull of a boat out of the water or in this case the air chair with the rider on top. Riders hold onto a ski rope and control the air chair by leaning into turns, leaning backward to raise the chair up and forward to return the air chair back toward the water. Skilled riders not only bring the air chair up out of the water but cause the hydrofoil to jump out of the water sometimes reaching heights of 5 metres in the air at which point gravity takes over and returns the rider back to the water and sometimes even in control. Pine Lake Leisure has been recognized as Canada’s only destination for an annual water-sport event known as a Hydrofoloosa organized by the Pine Lake Riders Hydrofoil Club. The airborne jumps, flips and turns that these riders are able to perform make the Hydrofoloosa spectacular. In 2017 the Hydrofoloosa will be running from August 10 to 13. At Pine Lake Leisure, you can just take your lawn chair to the beach to enjoy the show. Pine Lake is also home to northern pike, yellow perch and walleye. Walleye is catch-and-release only, and in recent years both northern pike and walleye have rebounded, providing an active fishery. Reports indicate that the fishing is more active on the northern end of the lake, and Pine Lake Leisure has a fishing dock that guests can fish from. Pine Lake is also popular for ice fishing in the winter. Pine Lake is closed for fishing April 1 to May 14. Pine Lake Leisure – A Parkbridge RV Resort opens on April 28, 2017, and has all the activities you are looking for at a beach-side resort to keep you as active as you want. Or you can also find relaxation in the forest, or on the beach or perhaps on a lawn chair watching the flights of the air chair riders during the Hydrofoloosa. Interested in more information about this resort? Visit www.parkbridge.com for photos and details. 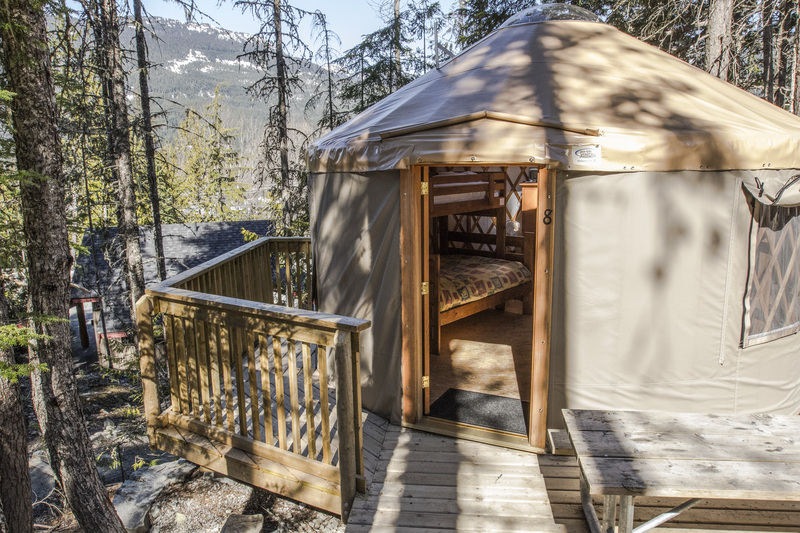 Have you ever wondered about what staying in a Yurt is like? At some of our Parkbridge Resorts we now have Yurts available for rent. Recently, blogger of Thrifty Mommas, Paula Schuck and family had the opportunity to stay at one of our brand new Yurts at Wasaga Pines Resort. Read all about her family’s glamping stay – and consider camping in comfort and booking a Yurt for your next summertime getaway! Recently, we hosted Akheela and family from Create with Mom blog at our Lakes of Wasaga Resort. Have a look at what she had to say about her family’s stay this summer. Looking for something different to do this summer? Yurts offer a great opportunity for the perfect ‘glamping’ adventure. For those that are used to camp tenting, Yurts allow the opportunity to step it up a notch and try out a more comfortable style of camping. For those that are used to staying in a cabin or cottage Yurts offer a unique opportunity to try out a more rustic experience, but still remain well-sheltered and comfortable. Yurts are generally much cheaper than hotel rooms and rental cabins. For as little as $100 a night, you can rent a six- person yurt at Wasaga Pines Resort in beautiful Wasaga Beach, Ontario. These comfortable Yurts are equipped with beds, a refrigerator and BBQ for ample summertime glamping enjoyment. Although sleeping under the stars can be nice, there are times when it is more enjoyable to have a roof over your head. Yurts provide the perfect link between open air camping and staying in a cabin. You get all the benefits of a solid roof above you, but the thin walls allow you to hear wildlife and feel outdoorsy. Yurts at Wasaga Pines have a large skylight in the roof to let the sun in by day and make stargazing possible by night. With the Wasaga Pines Yurts you get to experience refined camping, also known as “glamping.” With laminate hardwood floors, spacious beds, a fridge, storage space and a BBQ you’ve got all of the creature comforts of home and still get to experience the camping lifestyle complete with fire-pit and natural surroundings. Hotel rooms, cabins, and tents often have a way of segmenting groups. 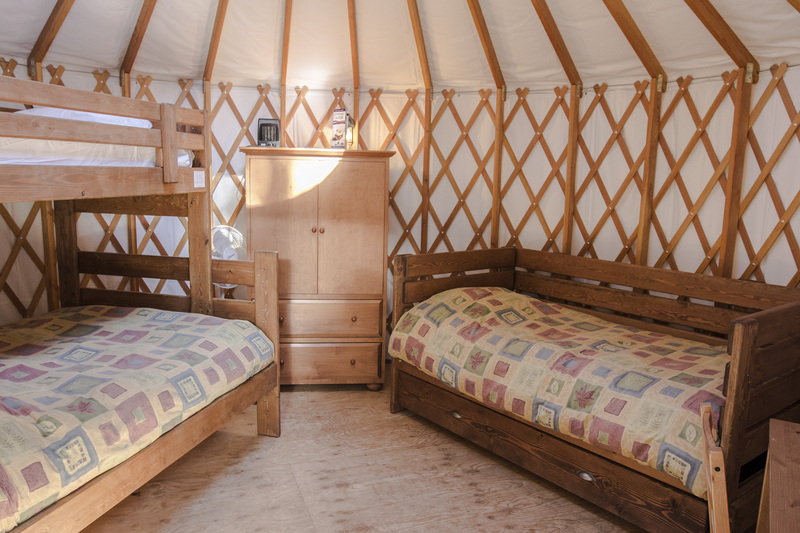 With a spacious Yurt, an entire family can comfortably stay together. Being in the same room encourages group games and storytelling, two things that are increasingly endangered in our technological world. 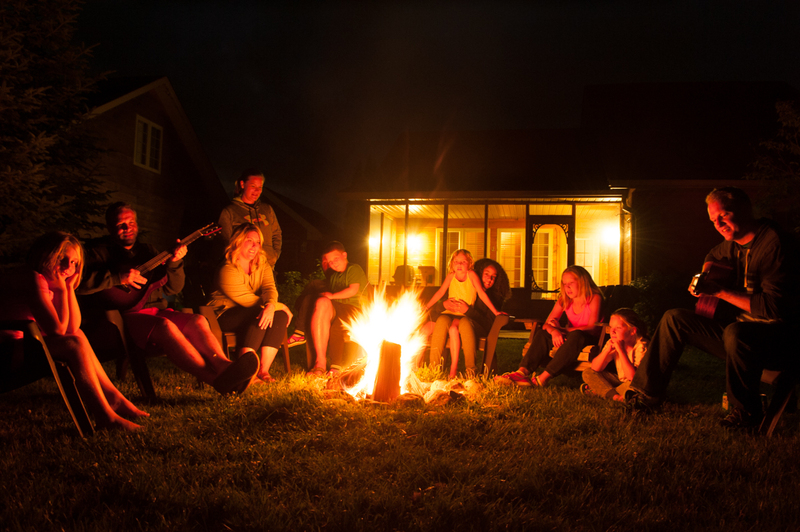 At Wasaga Pines in addition to spending time with family, the resort community provides family friendly activities such as BBQ’s, dances, and other social events to enjoy. Have a big family or a large group of friends? Wasaga Pines Yurts are side by side, and in total could accommodate a group of up to 18. Being surrounded by nature, and in a new setting you’ll want nothing more than to explore the area. Wasaga Pines Yurts are located in the perfect spot – allowing for easy, and ample exploration. Located just minutes from the largest freshwater beach it’s easy to soak up the sun lakeside followed by a campfire, then tuck yourself into your cozy Yurt for the night. Other area daytrip exploration could include visiting the town of Wasaga Beach, a nature hike, kayaking, golfing, mini-putt, enjoying local restaurants, ice-cream shops or even visiting the town of Collingwood – just a short 30 minute scenic drive away! Riverside Resort one of the top 10 greatest family vacation destination in B.C. Recently our Riverside Resort in Whistler, British Columbia was featured on the Culture Trip Blog as one of the 10 Great Family Vacations in British Columbia If You Are On A Budget. According to Canada’s 2016 census results (released on May 3), the country is witnessing an increasing number of seniors (up 20% since 2011) amid affordability concerns and growing demand for alternative housing solutions. These factors have major implications for the housing market, particularly as the “empty-nest” population looks to downsize – but land lease communities are offering a unique solution as a high-quality, yet affordable, home ownership model. Historically, when people thought of land lease, they thought of trailer parks. While trailer parks were an early version of land lease, the land lease home ownership model has evolved dramatically. Land lease homes are now both manufactured off-site and “stick-built” on location and, at-a-glance, typically look no different than freehold homes. They generally cost 30 per cent less than a freehold home, which means a lower down payment, lower monthly mortgage payments and no land transfer taxes. Invested partnership – Parkbridge stays, investing in communities alongside homeowners to ensure there is ongoing, thoughtful investment in community infrastructure, standards and amenities. Vibrant communities – Parkbridge fosters vibrant, active communities by ensuring homeowners have access to well-maintained shared amenities and feel safe, proud and connected to the communities in which they live. Quality and responsible development – Parkbridge offers a range of residential and recreational property options, which are built with a commitment to quality and environmentally-friendly features. Attractive to municipalities – with a decline in the population residing outside large cities, Parkbridge offers growth and revenue opportunities for rural municipalities. For more information on Parkbridge land lease communities visit www.parkbridge.com. No purchase necessary. This contest is organized by Parkbridge Lifestyle Communities (Parkbridge) and LinkedMoms and is open to all Parkbridge Lifestyle Community Residents aged 18 and older. Winner must be a resident of Canada (excluding Quebec). The contest excludes employees, representatives, agents, directors and officers of Parkbridge, and members of their families and the people with whom they are domiciled. 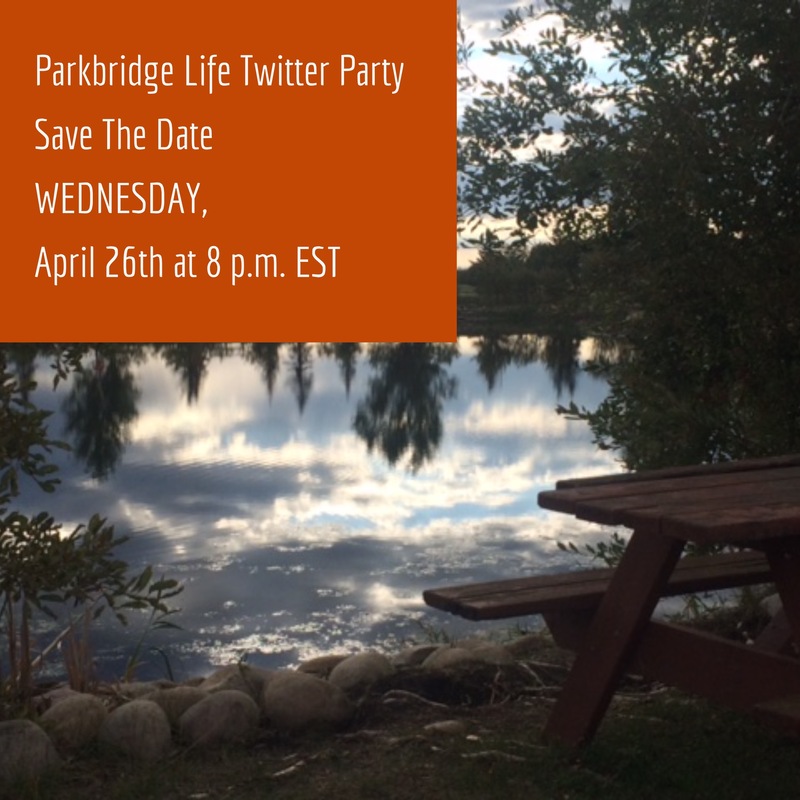 To participate, you must follow @ParkbridgeLife and @LinkedMoms twitter handles. You must also answer a mathematical skill-testing question. (10 X 5) + (6 -3) = ? The contest begins on April 26th at 8 p.m. EST and ends on April 27th, 9 p.m. EST. By participating in the Twitter party and entering you agree that you have read and understood these Contest Rules. 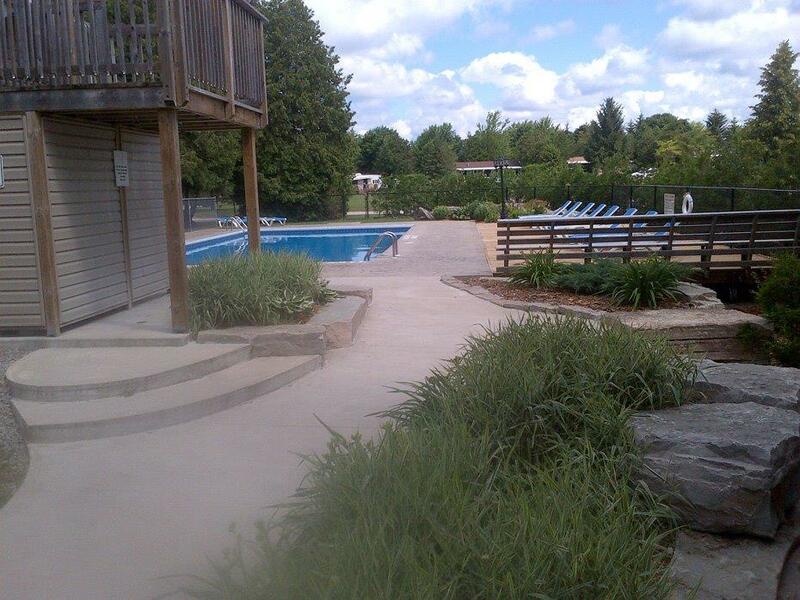 Four (4) prizes consisting of a 3 Night stay at a Parkbridge Lifestyle Community Resort – in this case Lakes of Wasaga(approximate value – $1,100) and 3 gift card prizes - $50 (Canadian Visa Gift Card) $50 (Canadian Visa Gift Card) and a $50 (Canadian Visa Gift Card) will be awarded to winners. The prize must be accepted as awarded or forfeited and cannot be redeemed for credit. 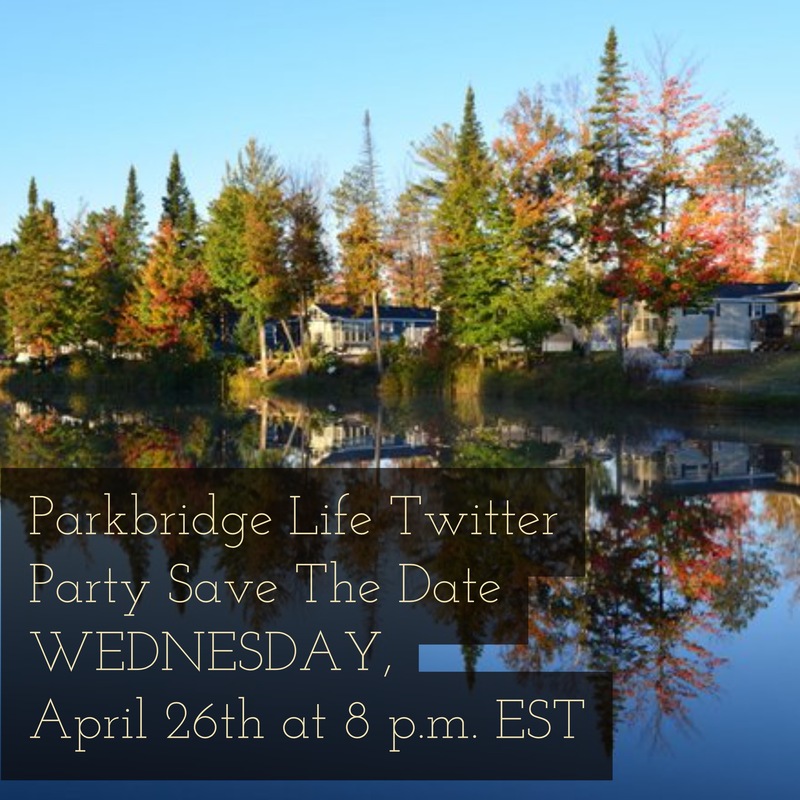 The resort stay must be utilized by October 1st, 2017 and will be at a Parkbridge Lifestyle Community Resort called Lakes of Wasaga. Transportation and meals are not included, the stay cannot be exchanged for cash value and is non-transferable. Winners will be contacted by direct message by Parkbridge no later than April 27th, 2017. If Parkbridge cannot get a hold of the winner within 7 days all of their rights and prizes are no longer valid. Failure to comply with one or more of the conditions listed above or any other conditions specified in these rules, the selected entrant will be disqualified and the prize will be forfeited. In such a case, Parkbridge may, in its sole discretion cancel the prize or make a new selection until an entrant is selected and declared winner of the prize. This contest is open to Canadian residents (excluding Quebec) only and is subject to applicable Canadian laws. Parkbridge is not responsible for technical hardware or software failures of any kind, lost or unavailable network connections or failed, incomplete, garbled or delayed computer transmissions that may limit or interfere with a participant’s ability to take part in the contest. Parkbridge reserves the right to cancel or modify the contest if fraud or technical failure threatens to destroy the integrity of the contest. The contest is void in any jurisdiction where prohibited by law and is subject to all applicable laws and all applicable federal, provincial, territorial and municipal force in Canada. Recently, we had the opportunity to host blogger, Paula Schuck and her family for a winter getaway at our Lake of Wasaga Resort. 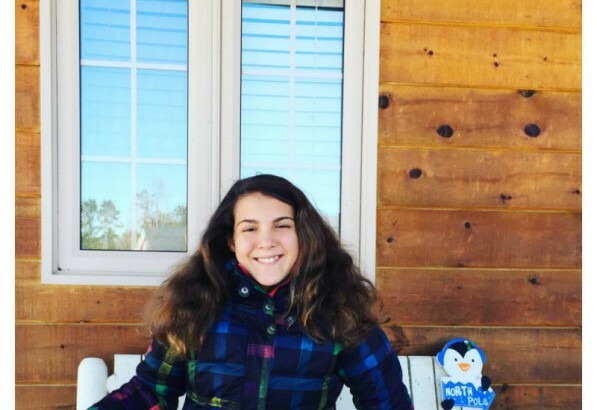 Have a look at what she had to say about making winter time family memories with Parkbridge! Parkbridge Acquires Nestle In Resort! BOBCAYGEON, ONTARIO, January 17, 2017 – Parkbridge Lifestyle Communities (“Parkbridge”) has completed the acquisition of Nestle In Resort, Heron’s Landing and Glenway Village. Located in the heart of the Kawartha region in Ontario, Canada, these properties are an exciting addition to the Parkbridge portfolio. These retirement, family, and cottage RV resort properties are a natural fit for Parkbridge which currently owns and operates over 115 land lease properties across Canada. Located on a stunning lakeside setting of 172 acres, with boat access to Sturgeon Lake and the Trent-Severn Waterway system, these three properties offer numerous onsite amenities including a 4,000 sq. ft community gathering centre and entertainment hall, beach volleyball and basketball courts, fitness rooms, swimming pools, marina slips, a grocery store and much more. 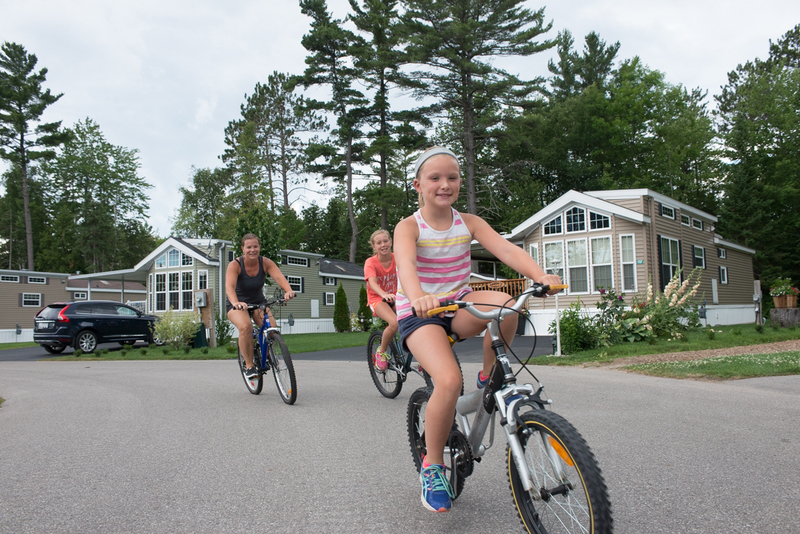 As Canada’s leading owner, operator and developer of residential land lease communities, cottage RV resorts and marinas, Parkbridge is committed to providing attainable, comfortable and secure places to live, vacation, and retire. Nestle In Resort, Glenway Village and Heron’s Landing will contribute to Parkbridge’s position as Canada’s leader in offering land lease communities in breathtaking settings. For more information on Parkbridge please visit www.parkbridge.com. well-located products, and communities which are geared toward Canada’s changing demographics. Parkbridge’s vision is to make residential and recreational communities affordable, yet exceptional.